Costa Rica Monkeys has 4 different monkey species, each unique in their own way. Whether you’re visiting the lowland jungles of Tortuguero or the misty mountains of Monteverde, you are bound to encounter at least a few of these monkey species. Travelers who visit wildlife hotspots like Corcovado National Park can see all four. Note: as tempting as it seems, please refrain from feeding wild monkeys, as it encourages an unhealthy reliance on humans. The Howler Money is famous for its loud, throaty calls that can be heard for up to two miles away. 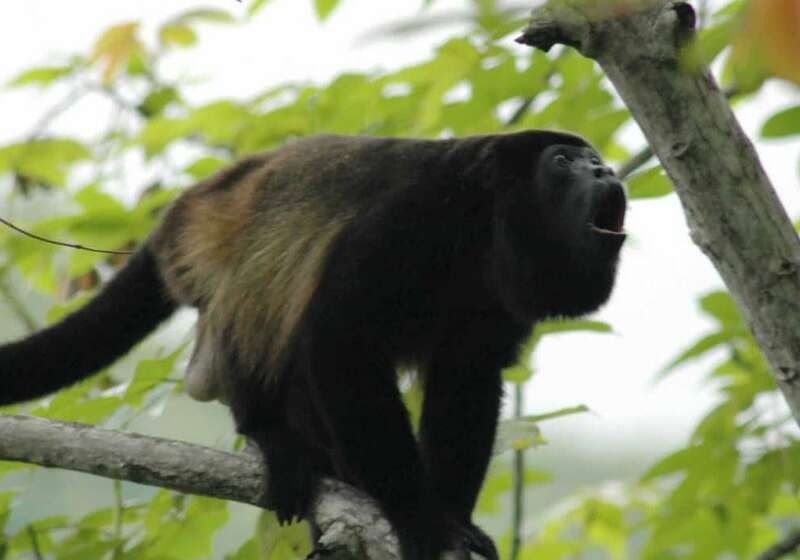 Howler monkeys of Costa Rica are one of the most common in the country. The mantled howler, known as mono congo in Spanish, are often seen foraging for leaves and fruits in the canopy treetops and they rarely cone down to the forest floor. You’ll typically see them in groups of up to twelve monkeys accompanied with several small babies in tow. Their howls are used to communicate within the troop and mark their territory. These monkeys are common throughout the country and you’re guaranteed to see them (or hear them) in Manuel Antonio, Arenal, Tortuguero, and Corcovado National Park. You will also encounter a lot of them in Guanacaste. 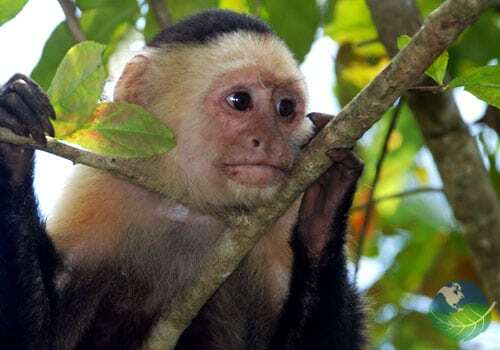 Also called capuchin monkeys, white-faced monkeys are much smaller than howlers and just as prevalent throughout Costa Rica. These highly social primates live in troops of up to 30 individuals and are frequently encountered along the sandy paths of both Cahuita National Park and Manuel Antonio National Park. True opportunistic feeders, they eat fruits, leaves, insects, eggs, crabs, and lizards. They communicate through a series of chatters, squeaks, and shrieks. They are also considered the most intelligent of all monkeys in Costa Rica. Unlike howler monkeys, the capuchin does descend to the forest floor in search of invertebrates and other food. You’ll see them all over the country, and in varying elevations, as this species is highly adaptable. 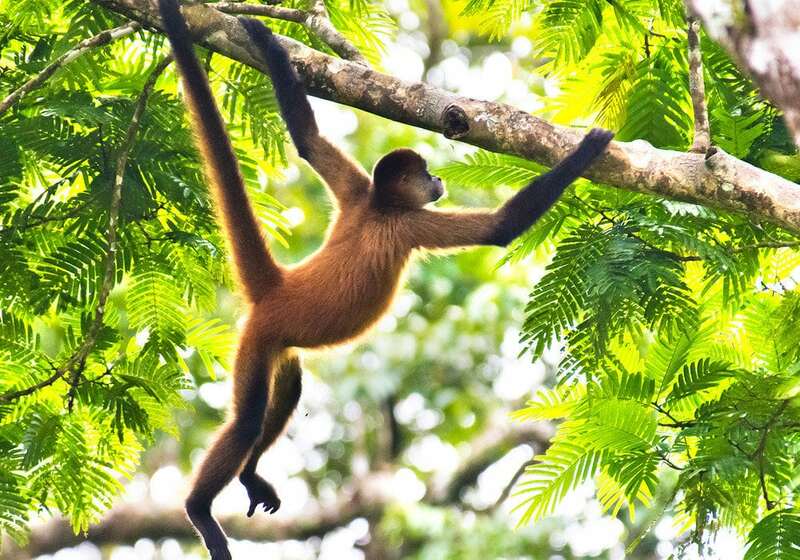 Known locally as the mono araña, the spider monkey is a delight to behold as it swings through the trees with the help of its long prehensile tail. Their fur varies from light brown to almost black in color, but all have a distinctive pot-belly and gangly arms that are much longer than their legs. Mostly arboreal, they feed on fruit, nectar, leaves, bark and the occasional insect. Spider monkeys are less common than howlers and capuchins and their largest populations concentrated in protected areas like Corcovado National Park, Monteverde Cloud Forest and Tortuguero. Curu Wildlife Refuge, on the Nicoya Peninsula, is another great spot to see these animals, as the reserve created a sanctuary just for spider monkeys. 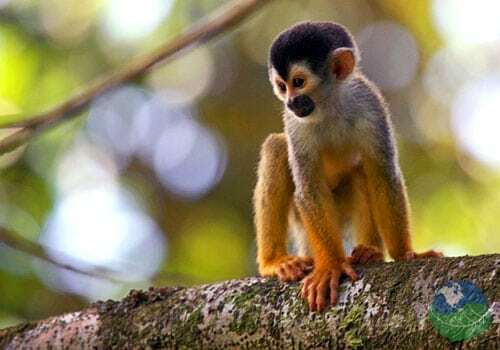 The smallest of Costa Rica’s monkeys at just two pounds, is the squirrel monkey, also called mono titi in Spanish. This highly endangered species only found in two places in Costa Rica: Manuel Antonio and the Osa Peninsula. 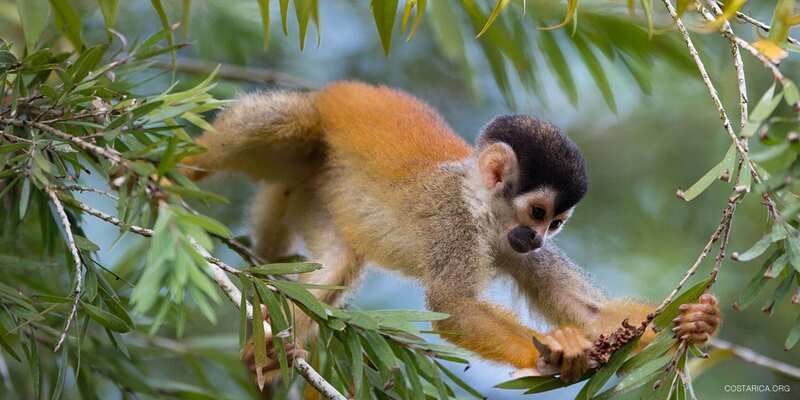 The Gray-crowned species inhabits the protected rainforest of Manuel Antonio National Park; while the Black-crowned squirrel monkey lives in Corcovado National Park. Due to their endearing appearance, these tiny primates fell victim to the illegal pet trade over the years, but their numbers are on the rise thanks to local conservation efforts and non-profit organizations like the Mono Titi Alliance. You will be amazed at the many different species of animals here. If you want to spot monkeys in Costa Rica by taking monkey tours or just by visiting the national parks where you have the highest chance of spotting them, let us help you!